Make Sure Your Certificate Gets To The Court On Time! If your certificate is due to the court within 5 business days, we recommend Express Email Delivery so you have enough time to receive your certificate, sign it (if necessary), and get it to the court by your due date. Get your certificate delivered to you by email within 2 days. 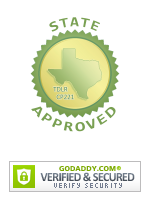 Certificate printed and delivered to you by USPS mail within 5-7 days. Many Texas courts require you to have a copy of your Driver Record in order to dismiss your ticket. Unlike many schools that charge you more for delivery, your record will be available to download from your student control panel at no extra cost. Bold fields are required. Email address entered will be used as username for the course. Certificate Shipping Relatec Questions, Express delivery, Email Delivery and duration.